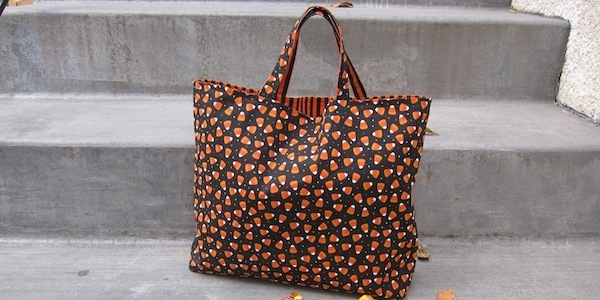 This month’s bag is a quick, little tote bag perfect for trick or treating. 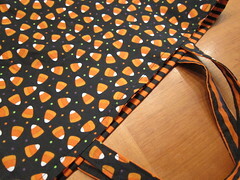 It’s reversible so your little ghost or goblin can have their pick of which fabric shows. We kept the straps short so little ones won’t drag it on the ground. 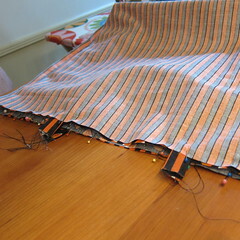 Firm interfacing at the bottom helps the tote keep its shape. 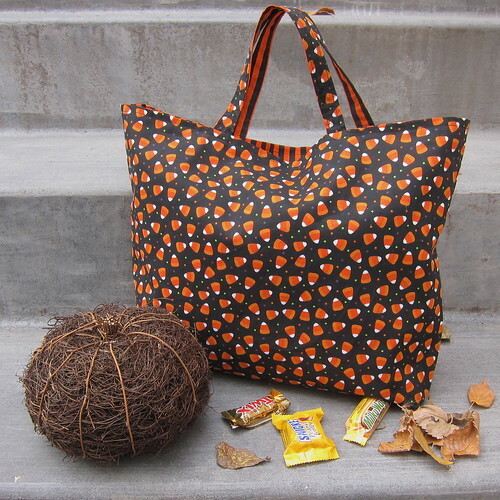 Since all our trick or treaters already have their own custom bags we’d like to give this one away. To enter just leave a comment on this post telling us your favorite thing to get in your trick or treat bag. Please only one entry per person. We’ll pick a winner on Wednesday, October 24th. This contest is open to everyone world-wide, but we can’t guarantee delivery outside the US in time for Halloween. All seam allowances are 1/2 inch unless otherwise noted. 1. 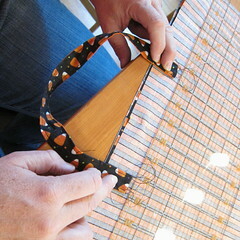 Put two straps of different fabric together right sides facing each other. Sew done each long side with a 1/4″ seam allowance. 2. 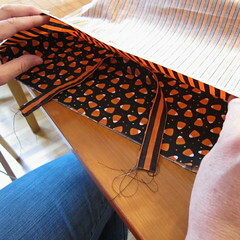 Press the straps and then top stitch along the long sides. 2. Iron the interfacing on the wrong side of this fabric centered on that bottom seam. 3. 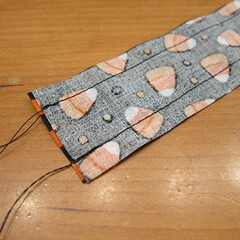 With right sides facing each other, sew the two short sides. 4. 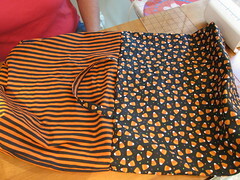 Sew a 3″ gusset on each side of the bottom. Turn right side out. 6. 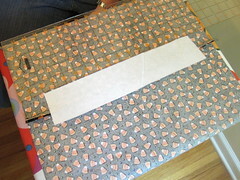 Put the outside of the bag in the inside, their right sides will be facing each other. 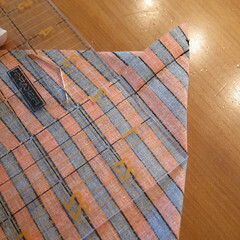 Match up the side seams and tops. 7. Figure out where you want the straps placed.. We did ours in 5″ from the edge of the bag on each side. 8. 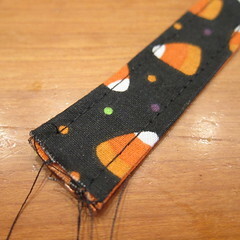 Sew around the top leaving a 3″ – 4″ gap. 9. Pull the right sides out through the gap. Push the lining fabric inside. 10. 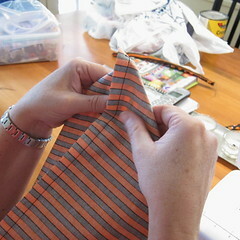 Press around the top seam, making sure to fold in the seam allowance at the open gap. Top stitch around the top closing the gap. And now you have a strong bag just ready to fill with tons of treats! 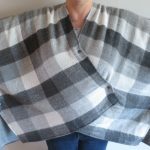 7 years ago by Kat in Giveaways and Contests , Halloween , Holiday , Needlecraft , Projects , Sewing , Sewing Projects | You can follow any responses to this entry through the RSS feed. You can leave a response, or trackback from your own site. 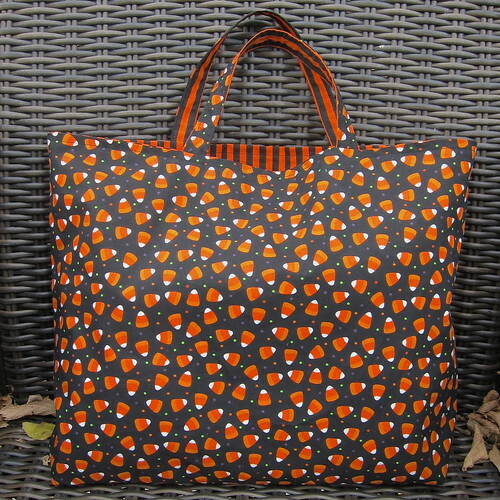 I’ve been looking for new bag/tote patterns recently, and I like both the simplicity and versatility of this one. The fact that you use interfacing and gussets to form the bottom is great. 6’2″, 220, 48 chest, Tall, Dark and Handsome. Great looking trick or treat bag. I love that you’ve made it reversible. I’d have to say the first thing I grabbed for were the Reese’s Peanut Butter cups. Thank you for the chance to win this super cute bag. Thanks for the opportunity to win this darling bag. Great details and well thought out. Good luck to all!! I don’t want in your contest, but i have been making these bags for about 10 years now. On some of the bags i made, i would sew some plastic canvas to the bottom to make them more durable. For the second generation, i would make decorations on them and found a bloody dripping font that i would trace on to the front to put the childs name on it. Then paint the name to make it look real. The grandkids, mostly boys like the dripping names. Girls would need sparkly, shiny names in a pretty font. Maxine – I’ve done the same thing with plastic canvas in the past, it makes a great bag bottom. Personalizing them is great. Full size candy bars. Or the mini Tootsie Rolls. Or Starburst. Basically, I just like the candy. This would be a great project bag, too! I love to get candy “Smarties” in my Trick or Treat bag!! Great purse pattern for every day of our lives…thank you.